This morning, after a busy, beautiful, fun, exhausting long weekend, our regular routine returns. The weather's warm and cloudy and I do love Spring mornings like this, when it's so quiet and dim. After a few long days where much-needed yard work replaced any chance of sewing time, and since I'm still waiting on the backing and binding fabrics to arrive so I can finish up my new Diamond Crisscross quilt, this morning feels like the perfect time to begin something new. A few years ago, around this very same time, I put together a bundle of soft grays, blues, corals, yellows, and aquas called Sweet Summer Dreams. These fabrics became the quilt I made to share my very first quilt-as-you-go tutorial and is one of my most favorite color combinations and quilts to date. This morning I can't get these same colors out of my head. 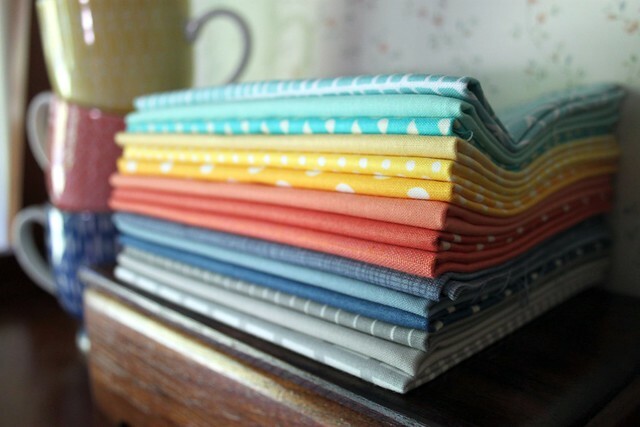 Pretty little piles left on my desk from the kids crafting are inspiring me to start pulling fabrics in this color palette once again! Plus, for once everything's all nice and organized! That never lasts too long in this room! I'll be back to share what I come up with soon! Love your color choices, nice pictures! Today I'm sandwiching a quilt, helping a friend alter two tops and visiting a new baby in the family. Fun! 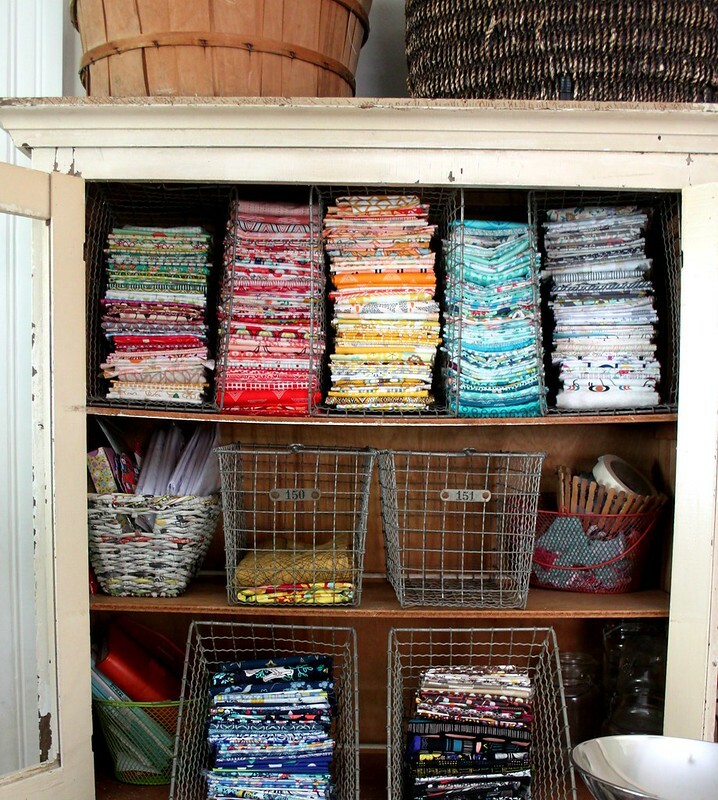 Love your photos, and your fabric stash looks so neat! Pretty colors!---I've been making chenille potholders for all my quilting buddies. The tut is on the side of my of my blog. And I've been transferring old VHS tapes to DVD's. So fun watching all the old family movies. That pile of fabric is lovely! I can't wait to see what you create with it! Your colors are inspiring. Those cards too. I really need to sit down and make a bunc of cards. Pretty! I have that same little notebook from target! My daughters and I have started a life list and we record the birds we've seen in it. Have a lovely summer day! I LOVE those colors together! So pretty. Whatever you come up with will be really pretty! I too love these colors. I am loving the notebook but the colored pencils are amazing. Are they for real? Thank you! 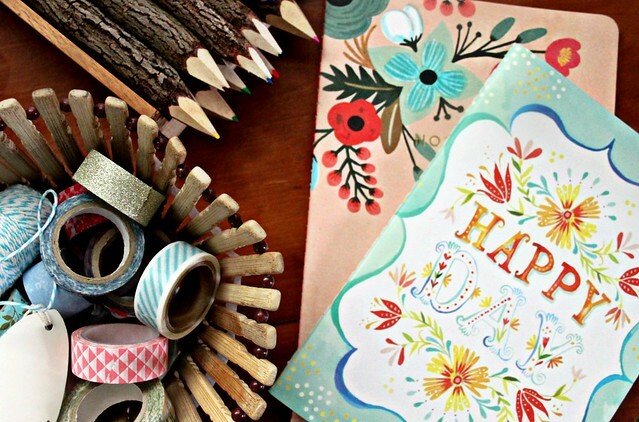 The colored pencils are real and we love them! We have so many, in all sizes, regular lead and colored. They're functional, beautiful, and the kids love to sharpen them, too! I'm hoping to sneak to my sewing room before my baby wakes up from nap time. That cupboard is just gorgeous!